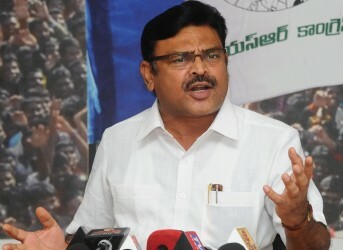 Vijayawada: Official spokesperson of the YSR Congress party (YSRCP) Ambati Rambabu said the yellow media was projecting Andhra Pradesh chief minister Nara Chandrababu Naidu as a great leader despite his failed governance in the State. He recalled that the yellow media supported Chandrababu's narrative for a special package to AP. Addressing media here today, Ambati said Chandrababu was increasingly getting unhinged mentally. "Chandrababu decided to form an alliance with the Congress after KTR rejected his proposal for a TDP-TRS alliance during the last rites of former MP Nandamuri Harikrishna," he recalled. Lambasting Chandrababu for befriending the Congress responsible for the bifurcation of the State, the YSRCP leader said the TDP chief was claiming credit for the Congress's win in the three Northern States and that no Congress leader shared the same opinion. The YSRCP leader further said Chandrababu became so opportunistic that he turned out to be a mere investor for the Congress. Actor Sivaji and former MP Lagadapati Rajagopal are agents of Chandrababu, he commented. From a deficit of Rs 96,000, Chandrababu pushed the burden of the State to Rs 2.5 lakh crore. Chandrababu will be rejected by the people in the upcoming elections, he added.